A lot of people ask my help to troubleshoot one particular annoying error that appears on Google Chrome: “Oops, Google Chrome cannot find <insert URL here>”. It doesn’t pop up in every site that you surf though, so a lot of users would think that there is a problem with that specific site they’re browsing. Chances are, there isn’t. The culprit? Your Google Chrome browser. 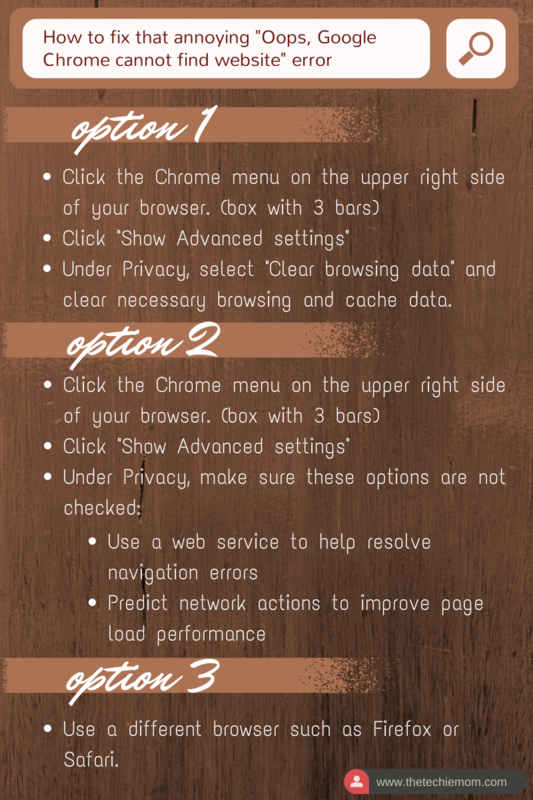 Google Chrome has been getting a lot of unsatisfactory feedback for “unexplained” errors, and this is one of them, Here’s an infographic I made on how to fix that problem. Go through the options one by one and see which one/s work well with your problem.